Most of us know that having a Lasting Power of Attorney in place can be an invaluable lifeline during trying times. It allows your family and loved ones to deal with your affairs, finances and welfare should you be unable to do so through illness, accident or old age. While many assume that power of attorneys are only necessary for the elderly it is important to remember that illness or serious accidents can strike unexpectedly irrespective of age. In our profession we see many examples of families who have not been able to enact the wishes of their loved ones or deal with their assets because they do not have a power of attorney in place. By the time a person becomes incapacitated it is already too late to create a power of attorney. Those who have had the good sense to create a power of attorney may think that they can be sure their wishes will be put into action. In emergency situations, however, this may not be the case because often nobody knows that a power of attorney has been put into place. Surprisingly there is currently no system in place that would allow medical professionals or emergency services to inform the attorneys if the worst did happen and you were incapacitated. That is if they even knew that you had a power of attorney in the first place. If this were to happen the power of attorney would be rendered useless right when it is most needed. 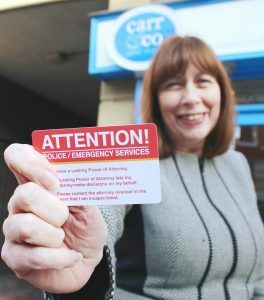 Our simple solution this problem was to create the lasting power of attorney emergency alert card. These durable plastic cards are designed to be carried at all times and act in much the same way as medical emergency cards. They alert medical professionals and emergency services and demand that they contact the relevant parties immediately. As part of our service we will also inform your doctor and other medical professionals so you can be sure that the right people know about your situation. It’s a shield that ensures your loved ones are kept in the loop when you most need it. Facing up to what might happen in the future may be daunting but we can ensure that your wishes are clearly expressed and create a lasting peace of mind. Call us today on 0191 284 0363 to speak to one of our power of attorney experts today.